Perplext Games is trying something a little new. They’ve developed a series of three-letter game titles that fit in a box about the size of a pack of gum (Pack O Game – get it?) and hopefully offer enough depth at dirt-cheap prices to engage gamers and get them to buy the others in the set. 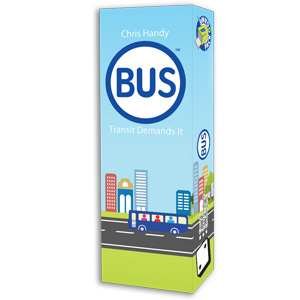 BUS, a pick up and deliver style game, is just one such inaugural selection. The object is to have the most points by the end. Two or three players are bus drivers picking up and dropping off passengers. Their route looks like a game of four square, with roads forming the borders. Some streets have bus stops, others have colored dots, and one has a construction symbol. 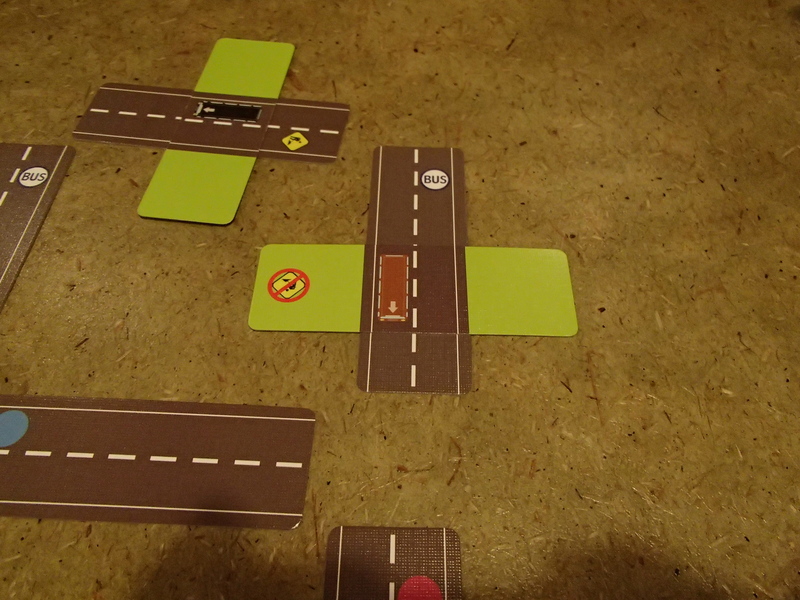 On his turn a player drives his empty bus as far as he likes – from one road section to the next is a move. He halts at any bus stop to pick up passengers, taking one of the two face-up passenger cards or making a blind draw from the deck. Each shows two colored passenger outlines, a point value, and a speed. Passengers disembark at the road section matching their color when the bus lands on or passes over it. 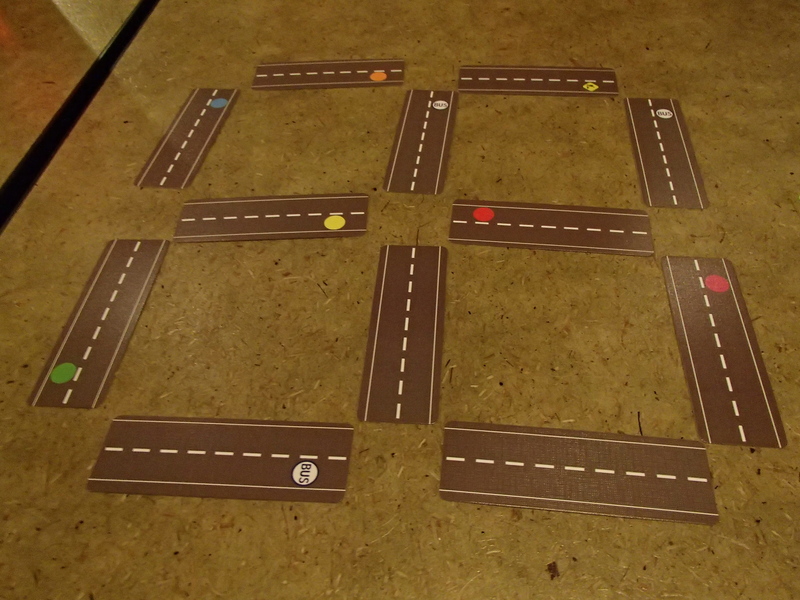 Cards sit on a player’s left until then, and shift to the right side of one’s play area to show which color passenger arrived (so if the rider on the left end of the card gets dropped off, the card is rotated upside down so that his end can be pushed over to one’s right for bookkeeping purposes). Once both colors have been deposited, the card is flipped facedown to show it’s complete. If encumbered with clients a driver motorvates only as fast as his slowest passenger card, so if he currently displays speeds two and four he can only cruise about town two streets per turn. Then again, slower rides mean more points. Sans passengers, he can once more go as fast as he wants; since buses have a “facing” he can approach a stop the long way around if it makes his next drop-off point more accessible. 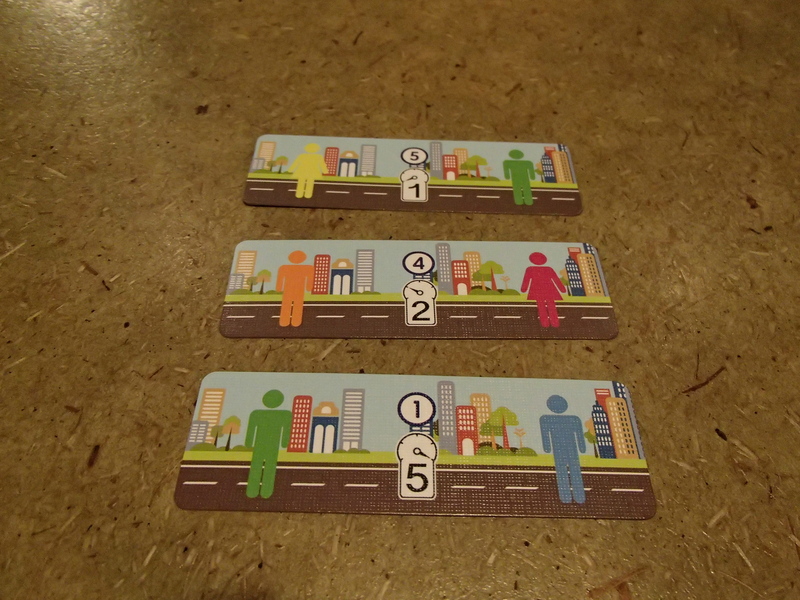 If the streets aren’t to one’s liking, however, once per game the bus can putter over to the construction area, flip his bus (one side indicates you have used your construction bonus), and switch two unoccupied road cards with each other. This brings destinations closer together, making delivery easier, or spreads them into unwieldy patterns to make an opponent’s life harder (how often can a bus driver claim he was late because two city streets had switched places?). When someone completes their fifth Passenger Card the other players get one more turn to finish their routes and then the game ends. The scores on completed Passenger Cards are tallied and the high score wins. Entries in the Pack O Games line come in an oblong tuck box with a deck and an instruction sheet. The BUS cards are a little flimsy but serviceable. The art is very sharp – when lined up properly the Bus Cards look like they’re under the Street Cards, the detailing is so crisp – though the red and purple colored dots look almost exactly alike. The same problem can be seen on the black and blue buses; one can easily be mistaken for the other. And, as seems to be the case with all entries in this line, one of the cards is essentially a slim business card for Perplext Games. All the play stuffed into the tiny box is clever and has just enough strategy to it to keep it from being a one-play curiosity the group buys only to have it hit the table one time. BUS is quick, it’s smart design, and it’s interactive. Time and replay may exhaust it of its immediate usage, but it doesn’t appear intended for intensive play and a supplement employing the same insight and invention could extend its inexpensive utility even further. Some of the games in this line end up scattering too quickly, with the delicate cards moving about as one picks up other cards adjacent to them. That doesn’t seem to be a problem for BUS: The required layout here is pretty stable. The method for tracking passengers is clunky but ultimately effective, and it’s a shame the game only takes three players. On the other hand, for those group caught between only having two participants and a full group, a three-hand setup might be just the . . . uhm . . . ticket.